Share a coke with… Generation Y! Last weekend I was in the local supermarket – looking for bananas, chocolate sauce and ice cream 🙂 – when I saw a girl, aged about 19, searching for something in the soda fridge. Very weird at first sight, but when I took a closer look, I saw she was searching for something between all the coke bottles… a name! And she was determined not to give up until she had found the bottle of coke which carried the name of someone she loves. With this new ‘Share a Coke’ campaign, Coca-Cola invites us to share a moment of happiness with friends, family and loved ones this summer. They do so by swapping their iconic logo – for the first time ever! – with our names, so we can share a coke with the people who matter most to us and post pictures of ourselves holding a Coke bottle with the name of a friend. 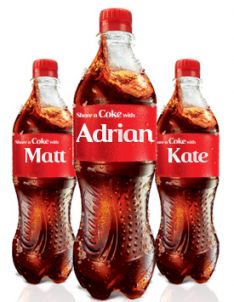 The campaign is a roll-out of a successful programme which started in Australia in 2011, where they put 150 of Australia’s most popular names on the Coca-Cola bottles. According to Jonathan Mildenhall, Coke’s global head of content and advertising, this was the most awarded campaign in the Coca-Cola history. That’s why this summer they are rolling out the campaign across the whole of Europe. So what if your name is not one of the 150 most popular names in your country? No worries, because in each country, you still have the ‘Share a Coke’ vending machines which tour around, giving anyone who visits the location of the vending machine the chance to choose the name they would like to see printed on a Coca-Cola bottle… which is then free as well. Yet again, the campaign is a successful one, as it’s currently making GenYers happy all over Europe by literally connecting them with each other. And socially connecting with other people is exactly what makes them happy. In our CRUSH model, ‘happiness’ seems to be the emotion with the largest impact on brand leverage. If you make Generation Y happy, they will feel a stronger emotional attachment towards your brand. And that’s precisely what Coca-Cola is doing with this campaign: arousing happiness through experiences: the experience of sharing a personalized Coke with a loved one or of receiving one. At the moment, Coca-Cola is even taking the ‘Share a Coke’ campaign to the next level, as they now also provide Coca-Cola cans which split in half, the most literal extension of the brand’s global ‘Share Happiness’ concept. So if you feel like sharing happiness yourself, rush to the supermarket and search for the name of your special someone!